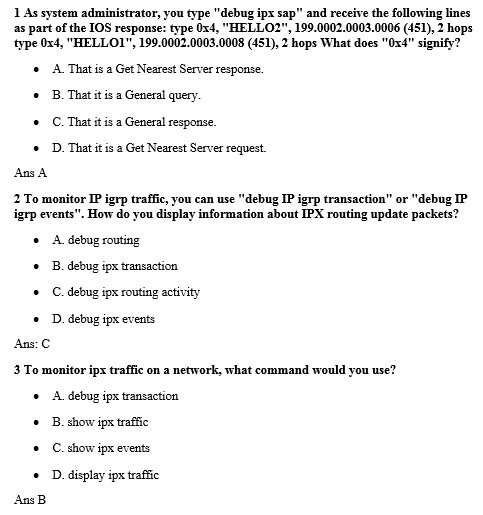 This is the 1000 sample question of CCNA Interview. 1000 questions collected to prepare the CCNA interview. 11 In Novell’s use of RIP, there are two metrics used to make routing decisions. Select the two metrics. It first uses ticks (which is about 1/18 sec. ); if there is a tie, it uses hops; if hops are equal, then it uses an administratively assigned tiebreaker. 12 What is the Cisco name for the encapsul ation type used on a serial interface? 13 “arpa” is used by the Cisco IOS for which encapsulation types? Novell’s IPX and Cisco’s IOS name their protocols differently. Cisco uses sap for Ethernet_802.2, Token-Ring, and Novell’s FDDI_802.2. Cisco uses snap for Ethernet_SNAP, Token-Ring_SNAP, and FDDI_SNAP. Cisco uses arpa for Ethernet_II and, finally the default is Nove ll-ether for Novell’s Ethernet_802.3. 14 “snap” is used by the Cisco IOS for which encapsulation types? and, finally the default is Novell-ether for Novell’s Ethernet_802.3.15″sap” is used by the Cisco IOS for which encapsulation types? Novell’s IPX and Cisco’s IOS name their protocols differently. Cisco uses sap for Ethernet_802.2, Token-Ring, and Novell’s FDDI_802.2. Cisco uses snap for Ethernet_SNAP, Token-Ring_SNAP, and FDDI_SNAP. Cisco uses arpa for Ethernet_II and, finally the default is Novell-ether for Novell’s Ethernet_802.3. For complete 1000 sample question of CCNA interview, download the document.